4k ready, fully HDMI and HDCP compliant. Supports Full HD 1080p, 2160p and 3D, suitable for HDMI 1.4 and HDMI 2.0 equipment and backwards compatible with older versions. 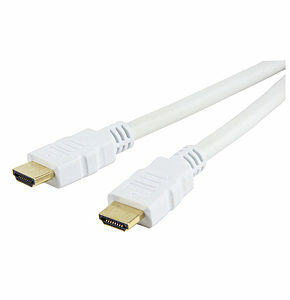 This 10 metre white hdmi to hdmi cable is ideal for connecting your HD equipment to your TV, it will provide perfect picture and sound at a bargain price, our Sharpview Gold range of white HDMI and digital leads produce perfect pictures at discount prices. All cables are RoHS and CE compliant. HDMI Audio Extractor Optical and 3.5mm with Pass Through Extracts the audio from an HDMI signal Supports 4k x 2k and 3D Analogue 3.5mm and Toslink digital audio output signal HDMI pass through Amplifies the digital video signal Easy installation: plug and play Splits the HDMI signal in HDMI and audio for high-quality image and sound HDCP 1.4 Compatible Selectable EDID with learning mode The HDMI extractor is ideal for extracting the audio signal from an HDMI stream to connect to a surround sound system, hi-fi or sound bar. The unit features an HDMI input, HDMI output along with a toslink digital audio output and a 3.5mm analogue audio output.